The Center For Holistic Medicine now offers Hyperbaric Oxygen Treatments. Hyperbaric oxygen therapy is defined as the medical use of oxygen at a higher pressure than normal atmospheric pressure. At higher pressures, more oxygen is able to be dissolved in the plasma component of blood and therefore delivered to tissues in your body. What is Hyperbaric oxygen therapy used to treat? Hyperbaric oxygen has 14 FDA approved indications; carbon monoxide poisoning, wound infections, traumatic brain injury and osteomyelitis are a few. Knowing that oxygen therapy increases plasma oxygen and therefore oxygen delivery to organs and other tissues, other uses are currently being explored. Some of the conditions that hyperbaric oxygen therapy has been used for include; anemia(low blood counts), candida and fungal infections, cerebral palsy, cluster headaches, inflammatory bowel disease, Lymes disease, migraines, traumatic brain injury and concussions. What type of chamber is used at the Center for Holistic Medicine? 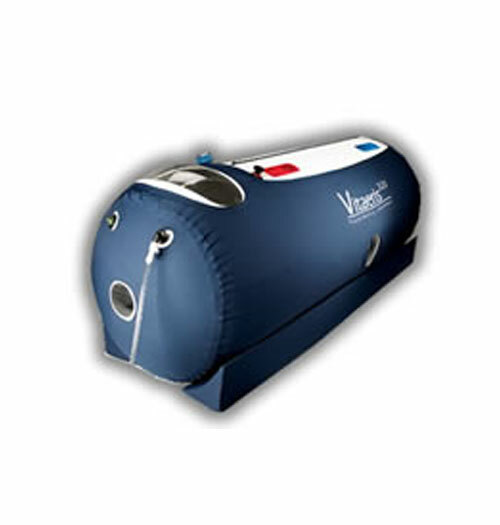 At the Center for Holistic Medicine we use a Vitaris 320 mild hyperbaric oxygen chamber. This chamber inflates to 1.3 atmospheres of pressure. This is the pressure that you would experience at 12 feet below sea level. An oxygen concentrator is also used during your treatments to increase oxygen delivery. How do I know if Hyperbaric Oxygen Therapy is right for me? If you are interested in hyperbaric therapy at the Center for Holistic Medicine, a history and physical exam would need to be scheduled and performed to be sure that you can safely have this treatment and that this is an appropriate therapy for your condition. There are very few contraindications to receiving therapy, however, it is important to be screened to be sure that you can tolerate the treatment and that it is the correct treatment for your condition. How long and often is HBOT used? Frequency of treatments vary based on the condition that is being treated. For example, cluster headaches or migraines may take intermittent treatments, whereas literature suggests 1-2 series of 40 treatments may be beneficial for the treatment of autism spectrum disorder. In order to make this convenient for families, we will rent the chamber for a monthly fee. It is recommended that you participate in 3 in house dives prior to renting the hyperbaric chamber. This allows you to learn how to safely use the chamber without injury to yourself or the equipment. How much does hyperbaric therapy cost at The Center for Holistic Medicine? There are two ways of obtaining hyperbaric oxygen treatments at the Center for Holistic Medicine. The types and costs are presented below. Please note that there is an additional one time charge for oxygen mask and tubing to be used with the oxygen concentrator. For more information please contact us directly.